We offer four ways to advertise your products or services on the evitherm website. The first one is FREE, the other three are pay-for but at very attractive rates. 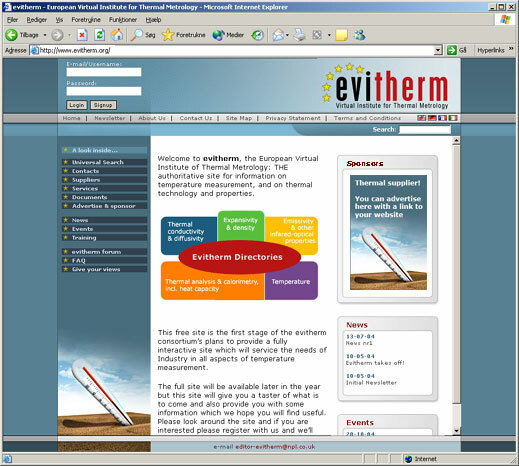 If you are a registered evitherm user you can enter your free listing from your User area. 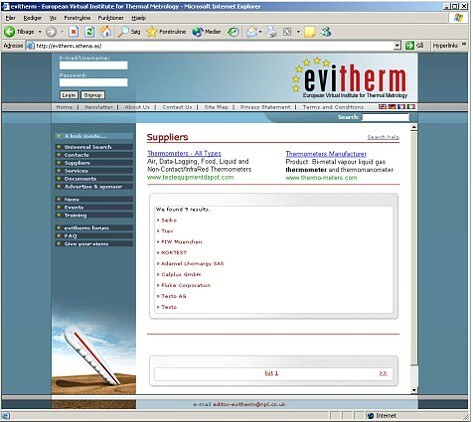 If you are not already a registered evitherm user, then register now by clicking on the Signup button at top left of the website. Once you are in the User area you can enter the details of your product or service by clicking on New contact in the left-hand menu. The information that you provide will be stored in the evitherm database and, once approved by the evitherm editor, will be made available to anyone searching on the evitherm website. You will be able to alter the details of your product or service at any time and as often as you like, simply by returning to your user page (select" List my contacts. Below is a screenshot of how a listing is displayed. This is what results if a user clicks on Services in the left-hand menu of the website, and then selects Equipment supply from the Service type box. Click on the free Signup button at top left of the website and follow the instructions in entering your contact details. (Alternatively, if you are an existing user then just log in.) Then, on your user page, click on 'New contact' and enter information about your product/service in the boxes provided. If you have any difficulty in entering your listing by the above method then please explain your problem to the editor , who will be pleased to help you. It shows the company name, logo with hotlink to the website, the country and some brief comment about the product or service offered. This shows the same sort of information as for Equipment supplier but in this case there is also an email link, which will help the user to immediately find the right contact. You may wish to have your consultancy, measurement, equipment or other service displayed in similar fashion to the examples above. Details on how to place your advert are given in the table below. 300 euros per advert placement per 6 months; 500 euros per advert placement per 12 months. Send your advert text, website URL and artwork (logo) to the evitherm editor, who will then upload your advert onto the specified technical page. The editor will then confirm the details with you and give instructions on how to pay. For any enquiries or problems with preparing and sending your advert please contact the editor. The advertising banner size is 120 x 60 (width) pixels. See the illustrative banner ad layout below. In this scheme, a hot-linked banner image is randomly selected for display each time the page is refreshed. Prepare a jpg or gif image, of dimensions 120 x 60 (width) pixels. The image must contain all the artwork and text that you want to see displayed on the home page. (ii) send your image and URL to the editor , who will arrange for your advert banner to appear on the home page of the evitherm website. The editor will then confirm the details with you and give instructions on how to pay. your website address with accompanying text can be displayed when the user is specifically choosing search words that link to your advertised service or product. The search words that trigger the display can be chosen by you, the advertiser, when you are placing your advert. In the illustration above there is a website link and two lines of text describing the product or service. This is a targeted method of linking a service or product, since the user is searching on the keyword(s) that you have provided. For example, suppose you sell thermocouples and you supply the keywords thermocouple, contact thermometer, thermometry and temperature measurement. If a user searches using the word thermocouple then your advert will be a candidate* for display alongside the search results, as in the above example, i.e. it will be selected and displayed randomly from a collection of adverts that have the same key word(s).